“All you need is ignorance and confidence; then success is sure. Coaching models and practitioners seem to be increasing exponentially these days. There are even organizations and training institutes devoted specifically to this particular intervention—each with different models, approaches and even ethical/professional guidelines. It seems “everyone” is now doing ssome type of “coaching” for a variety of clients (e.g,, executive, career, life, wellness, etc.). Many of the larger human resources consulting and outplacement companies now provide and “specialize” in coaching services. Countless coaching books and articles are being published on the topic despite little or no systematic research or evaluation behind them. Many coaches are typically using a variety of assessments with their coaching interventions including personality, style, mutli-rater feedback, and cognitive ability1. A new book called Psychometrics in Coaching published by Kagen Page (2012) offers expert advice on how coaches, consultants and human resources managers can use psychometrics to support and develop individuals in the workplace and outside. With a growing demand for psychometric testing in the coaching profession, coaches and practitioners alike need to understand the psychology underpinning the tests as well as how to select and apply them effectively. 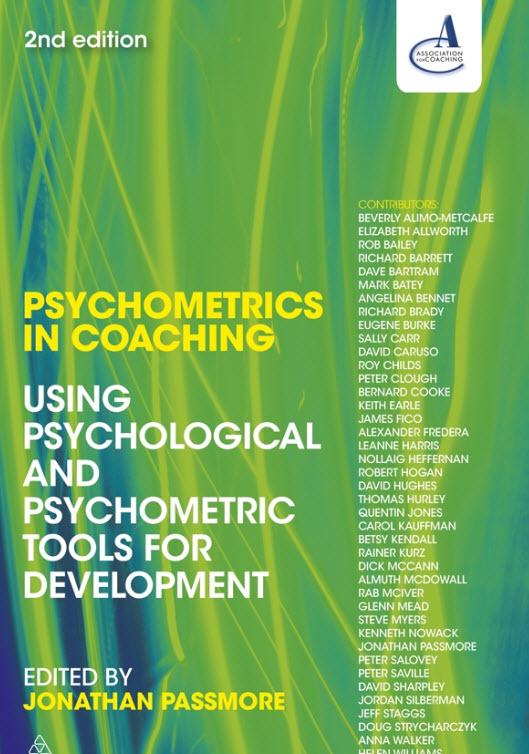 Written by an international team of global coaching practitioners, researchers and psychometricians, this book provides an overview of using psychometrics and providing feedback and offers clear explanations of the key models and tools used in coaching today. Using psychometrics and psychological tools in coaching; Using feedback in coaching; Coaching with MBTI; Coaching for teams – Team Management Systems (TMS); Coaching with OPQ; Coaching with Motivation Questionnaire; Coaching with Saville; Consulting WaveTM; Coaching for emotional intelligence (MSCEIT); Identifying potential derailing behaviors – Hogan Development Instrument; Coaching for Transformational leadership – ELQ (Formerly TLQ); Developing resilience through Coaching – MTQ 48; Using archetypes in Coaching; Coaching for Strengths using VIA; Coaching for Stress – Using Stressscan for Lifestyle Coaching; Coaching for Cultural Transform – CTT; Coaching with FIRO Element B; Coaching with LSI; An overview of psychometric questionnaires. My chapter on Coaching for Stress: Using StressScan presents information on how and when to use a personal stress and health risk appraisal in executive coaching interventions when issues of job burnout and work/family balance exists. The chapter describes the theory, development and validation of this useful coaching tool as well as our online wellness developmental planning and resource system called Talent Accelerator. StressScan has over fifteen years of published research showing significant associations with a wide range of health and organizational outcomes such as absenteeism, job satisfaction, physical illness, job burnout, depression, anxiety, and psychological distress in working adults. A large international normative data base is used to compare lifestyle practices, health habits and wellness practices in working adults. This is a great tool for executive and life coaches to get acquainted with and consider including in their assessment “tool kit” to help facilitate behavior change to cope effectively with work and life stress and balance. So, for coaches looking at new and older assessments to utilize in their engagements, I’m honored to be part of a wonderful collection of authors/researchers and their assessments such as Robert Hogan (Hogan Assessments) and Peter Salovey (MSCEI emotional intelligence) to name just a few. If you want a free trial of StressScan, please email me at ken@envisiaonline.com and I’d be happy to set you up and allow you to retrieve your confidential report automatically when you are done.